The Ocean Beach Town Council will have a presentation and discussion on short term vacation rentals tonight at its monthly meeting, Wednesday, June 22. Representatives of the group that has been lobbying city government to “do something” about the disruption to residential neighborhoods, Save San Diego Neighborhoods, will be making at least one of the presentations. They will be discussing how the hundreds of short term rentals in OB and other coastal communities are cutting into San Diego’s housing stock – and making rents higher and even more restrictive. They will demonstrate how neighborhoods are negatively impacted and disrupted. And even how the character of a neighborhood is altered. This is all well and good – and necessary. Communities like Ocean Beach need to have these discussions and neighbors need to understand the full ramifications of allowing unbridled short termers to infiltrate the blocks of housing at the beaches. And Save San Diego Neighborhoods is leading the charge against what happens when housing is turned into mini-hotels with vacationers partying every night. But, one thing that SSDN and other critics of short term vacation rentals need to grapple with is how to fine tune their analysis in order to incorporate a larger, wider vision of the consequences. 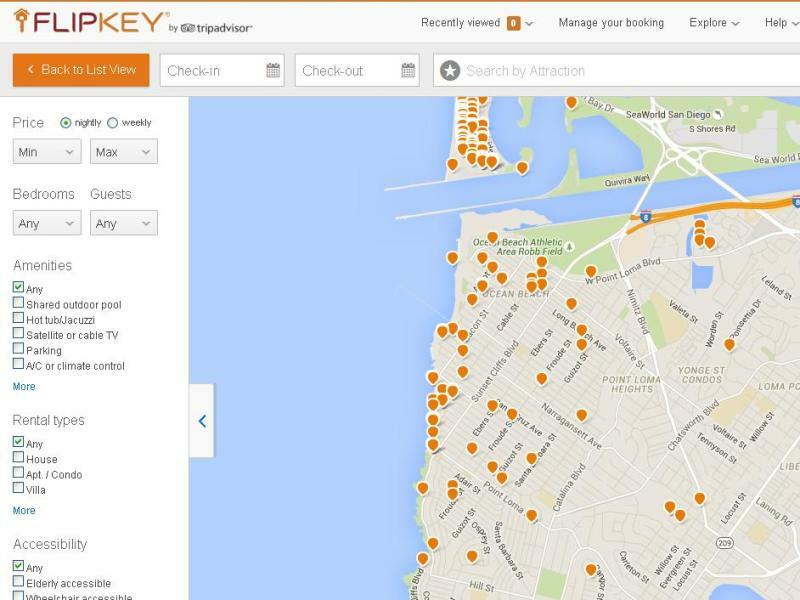 Mission Beach map of flipkey vacation rentals. If there’s no one left to care about the community or that section of it, then there is no community. This could be obvious. But take a walk or bike ride along the boardwalks that run along Mission Beach and Mission Bay. Try to count the buildings where actual residents live. It’s depressing. This is the same threat, now, aimed at Ocean Beach. 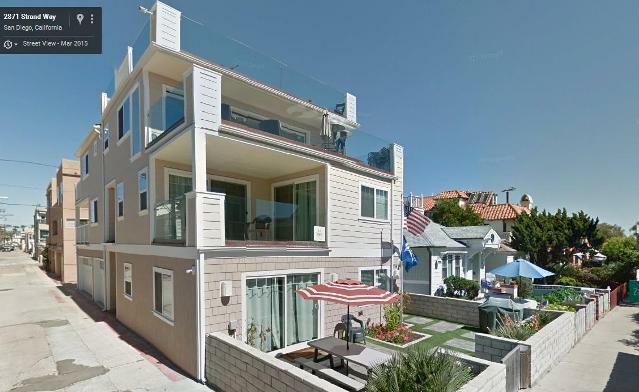 If enough little cottages, homes, apartments are turned into vacation rentals, then this is a larger threat to the culture of Ocean Beach than gentrification. And to those doubter who say ‘it will never happen in OB’ we looked at some numbers. Another review of Airbnb in August showed that the company for OB had 198 rentals, of which 141 were for the entire place – 71%, for an average of $178 a day, 53 private rooms and 4 shared rooms. Gee, you might say, these are really reasonable rates to stay at the beach – and they are – if they were staying at a resort hotel – but they’re not! They’re staying in a community where real people have to make real rents and real mortgages. Look at the context. According to the demographics of Ocean Beach from the OB Planning Board website, there are 7914 residential units in the OB Planning Area (a smaller area than “92107”). If six out of every 7 OBceans rents, then it would be safe to say that there are roughly 6350 rental units in OB. If hundreds of these units are being turned into STVRs, that is significant. Without dealing with any overlap, let’s say we combine the numbers from Airbnb and VRBO for OB. We then are looking at 335 units as vacation units. That’s five per cent of the total number of rental units. That’s a huge number and percentage for a long-term rental market in Ocean Beach that is already tight. The loss of community for Ocean Beach is one of the chief threats from this so-called “sharing economy”. If significant sections of OB are no longer available for residents, then there are no longer residents available for OB. We need to pressure our political representatives at the City level – who have been sitting on this issue for up to two years now – to get off their duffs and prohibit illegal evictions of tenants for vacation rentals. Los Angeles is now cracking down. Why not San Diego? Unregulated short-term rentals are a scourge and a huge threat to O.B. This is a real town, with a real heart. Finally: awareness is happening. Hope some action is taken. I missed the OBTC meeting: what happened? Full page ads by the “perps” in local papers: even the Beacon! OB peeps unite we have been successful in the past: “The Boardwalk”, “The Stub Jetty”. On Greene St. and on https://www.airbnb.com/rooms/9282961-2270” Etiwanda St.
From Jun 19, 2016 – Jun 02, 2017 the minimum stay is 3 nights. Same with the mini-hotel at 4738 Del Mar Ave owned by Rodney (actually 2 cottages). From the listing: “This home is available for nightly, weekly and monthly rental”. And he owns multiple AirBnB’s in multiple cities. Clearly a business. Also curious if any one has a recap of this meeting – it’s a very important topic to me but I was out of town for work. The seasonal vacation rentals are killers to rents and housing. However, I don’t think people air bnb their place one weekend a month counts – that’s not driving up rents. The pros who own places just to air bnb are problems and should be regulated – own a hotel!